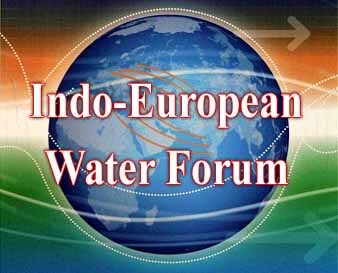 New Delhi : The Indo-European Water Forum's First meeting is being co-organized by National Water Mission, Ministry of Water Resources, River Development and Ganga Rejuvenation and the Environment Directorate-General of the European Commission on November 23-24 at New Delhi. The meeting held for discuss key issues in water resources management in India as well as the experiences of implementation of European Water Policy. The forum will be attended by Director General of Environment Directorate-General of the European Commission Daniel Calleja Crespo. The Meeting will also be attended by Diplomats, Senior officers from the Central Ministries, State Govt’s and UT’s, World bank, UNDP, ADB, World Business Council for Sustainable Development, FICCI, CII , researchers, practitioners and academicians amongst others. India’s water challenges are complex and include quantity, allocation, quality and management issues. Increasing competition for water among industry, agriculture, energy, domestic use and the environment has highlighted the importance of managing water on a river basin, and multi- sectoral basis in a sustainable manner. The agricultural sector is currently India’s largest user of water, however, as urban and other demands multiply, less water is likely to be available in order to meet the nation's irrigation and individual needs. Therefore proper allocation – management of the demand and efficient measures are urgently needed. In the context of these complex water challenges, the European Water Policy, centered on management at the river basin scale and integrated water management, presents a viable model for cooperation between the EU and India at the national and state level. The European Water Policy supports the Member States of the European Union in setting up appropriate governance structures which allow for an understanding of impacts and pressures to water resources including pollutant emissions, water over-use, morphological impacts, climate change effects; land use and effects from economic activities such as energy production, industry, agriculture and tourism; urban development and demographic changes. This framework which determines the implementation of water policies and legislation at national level could, therefore, be used by India as a source of inspiration to integrate water resource development and management across its states. The Indo-European Water Forum will provide the platform for policy makers and stakeholders to discuss key issues surrounding water resources management in India, as well as transferring the lessons from the experience & implementation of European Water Policy. The main themes to be covered during the discussion will include Water Governance and Legislation, River Basin Management, Water Policy in India and European Union, Coping with water scarcity and the Ecological Aspects of water management and Research, Innovation and Business Solutions for Water Challenges to chalk out the way forward for Sustainable Water Management in India.